I’m not the biggest fan of traditional sports games. What I really enjoy are the wackier takes on popular pastimes that channel the familiar into a stranger landscape of rules and regulations. I’ve been hooked on HBO’s Hard Knocks which has led me back to American football. Following my series of “strange” articles, here’s five strange football games you can distract yourself with until the football season officially starts. I still can’t believe this game is real. Starring Jerry Rice’s dog, Nitus, it’s about canine football. Literally, dogs playing football with one another. The only human is the quarterback and your field includes parks, shopping centers, and someone’s massive backyard. You control the receiving dog by pointing the Wii’s doggy bone emblem wherever you want your furry companion to run. Bonus ARF points if you take the road less traveled (did I really just make a Robert Frost reference in a list with a football game starring dogs?). In its early days, football was so violent and dangerous, it resulted in a number of fatalities. 1905 was a particularly bad year with 19 people being killed. In response, President Theodore Roosevelt threatened to abolish the game. Brutal Sports Football for the Jaguar takes the opposite track, encouraging even more violence. As super powered football players on teams like the Slayers and Assassins, you have swords and bombs to help you break through the defense. It’s more like a gladiatorial match that happens to have football as a backdrop than the traditional sport we’re used to. Powering your way up the league ranks, you can literally lop off the heads of opposing defenders. As for rules, the only one is to survive. Brutal alright. It’s more like F-Zero mixed with futuristic soccer than Madden. On top of that, the controls and visuals are a bit clunky. But after the disappointment of finding out Back to the Future 2’s prediction of hoverboards wasn’t coming true last year, at least now I know in the future, I’ll get to drive retro grav hovercrafts to play one-on-one football against opponents in mode 7 scrolling. 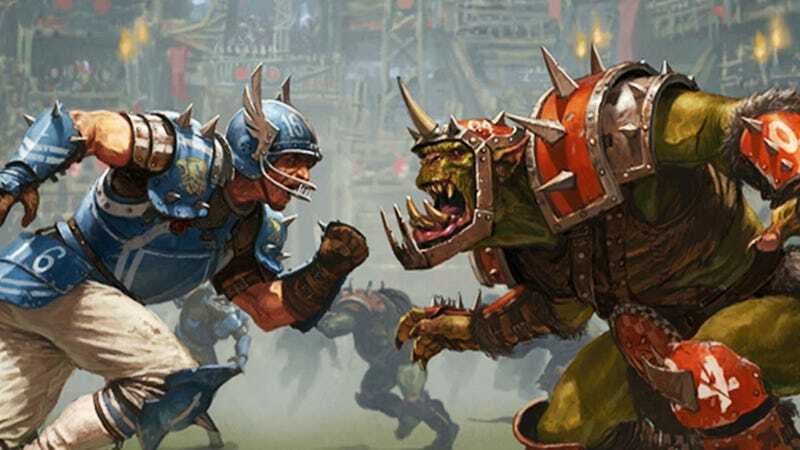 What if American football took place in a fantasy setting based on the Warhammer Universe, rife with orcs, goblins, and elves? Sounds amazing. But the gameplay is actually more akin to Final Fantasy Tactics than it is Mutant League Football (a strange football game in itself that would have made this list if not for me having worked at EA before!). Based on the board game of the same name, Blood Bowl has you win by either scoring more touchdowns, or killing all the players on the other team, literally leaving behind a bloody bowl.